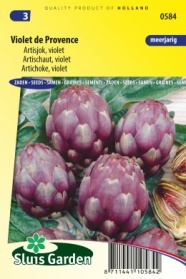 A perennial with violet flowers that are harvested as vegetables before they open out. A true delicacy! If not harvested on time the flowers produced are attractive. Sow in a greenhouse in a seedbed or preferably in pots in order to avoid damage to the tap root as much as possible. Remove the spiniest plants in order to cultivate only the strongest and most attractive plants. Requires considerable fertilization. Is not completely winter hardy, therefore cover in winter with, for example, straw.